When Oprah had her daytime TV show, she had a once a year episode dedicated to her favorite things she discovered during that year. Her audience would go nuts because she gave away each of those items to them. The companies making them would benefit from the show because of monster sales and all the publicity and many couldn’t even keep up with the demand! Even though the show ended a few years ago, Oprah still curates a list every year but she shares it with the world through her magazine, “O”. She also takes it one step further by partnering with Amazon to make her picks available on there for you to shop for easily and have them delivered quickly to your doorstep. 2018’s list is quite varied and covers gift ideas for many different kinds of people. 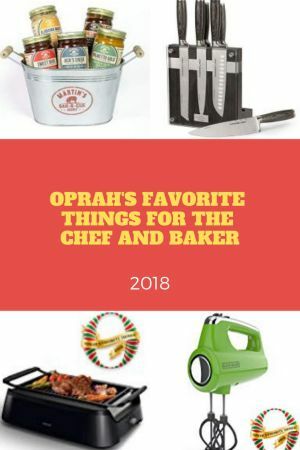 Here we’re only going to cover and review Oprah’s Favorite Things for the chef and baker in 2018. Some of Oprah’s 2017 picks and 2016 picks are still available as well. We also have a few of our own gift ideas for various budgets if you’d like to take a look. Otherwise, read on to see if there’s anything here that may strike your fancy, either for yourself or as a gift for someone who likes to cook or bake. Fans of hot sauces rejoice! There’s a new one to try or gift this holiday season. There are so many brands of hot sauces on the market now that it’s not easy for another new one to stand out but the gourmet TRUFF Hot Sauce has quite an elevated flavor profile. Well, if it has real black truffle in it then it must be so! In addition to black truffle, the blend includes ripe red chili peppers, organic agave nectar and spices, all for the perfect balance in flavor and heat. Unlike most other hot sauces, this one gives you a silky mouth feel. All ingredients are sourced from the best suppliers in northern Italy and Mexico and there are no preservatives added at all. Of course, such a sophisticated blend is naturally packaged in an artfully designed 6 oz bottle that features a black truffle-inspired cap. If just a truffle flavored hot sauce seems too small a gift, then consider the 2.4 pound Sabatino Truffles Pasta Night gift set. It contains three truffle infused items that will elevate anyone’s dinner up by quite a few notches and make an amateur home cook feel like he or she’s a master chef! The first item is truffle pasta that is gluten free and is made in Italy from dried corn and rice flour. The flour is infused with dried summer truffles. The bottle of all natural pure olive oil infused with white truffle oil is robust and earthy and is meant to be used as a finishing oil lightly drizzled over the cooked pasta just before eating. It is also kosher and gluten free. The final product is Truffle Zest, a black summer truffle infused seasoning powder. Not only can it be sprinkled over pasta, but it’s also delicious on eggs, popcorn, potatoes and proteins. Even experienced truffle connoisseurs will love this Sabatino set, as the recipes have been handed down through generations and the ingredients sourced locally, like the truffles from Umbria. Why make just one lasagna for dinner when you can make 3 in one shot? Well, with the Chicago Metallic 26783 Professional Lasagna Trio Pan you can do just that. It’s a lasagna pan that’s divided into 3 equal sized channels, each sized to fit one standard lasagna sized noodle sheet. There is no overflow between the channels so you can use 3 entirely different recipes for each. Use different flavors of pasta sauces and different cheeses between the layers. Top each off with a different ingredient or use one of the channels for a vegetarian lasagna, while the others are non-vegetarian! In fact, this pan is great for also making 3 different cakes, loaf breads or meatloaves. Maybe even 3 different mousses for dessert. The possibilities are endless! This pan is made of heavy aluminized steel, which is great for even baking and superior heat conduction. The silicone based non-stick coating makes for easy release and cleanup. It is heat safe up to 450 degrees F or 232 degrees C and also dishwasher safe, although hand washing extends the life of the pan. It measures 13″ x 9″ and is 1.5″ high. Each loaf measures 3.5″ in width. Far too often dinner gatherings are treated as events that must be organized at least once a year and then quickly forgotten as we get back to our regularly scheduled lives. However, there are some dinner hosts that like to make their parties extra special and memorable in whatever small way they can. Those are the hosts that will appreciate this next gift – “Menus: A Book for Your Meals and Memories” by Jacques Pépin. It is a journal designed by the famous French TV chef who himself likes to document memorable meals with family and friends in a keepsake journal. This beautiful journal’s artwork is done by the Pépin himself and its pages allow you to record a menu that a dinner host has created for a gathering, whether casual or for a specific celebration. Not only can you document the dishes you served, but also the drinks, the music you play, the decorations you displayed, etc. You can have each guest sign or write a small note if you like. This archive of memories features a beautifully illustrated heading and border on each page to frame each menu, guest list or other details about the meal. Every cake baker needs a hand mixer. The reason is because some mixing jobs require more than just a quick whipping of eggs with a fork but it is overkill to get out the stand mixer for the same job too. The former tool is just fine for making omelets and the latter is ideal for bread. With a hand mixer like this BLACK+DECKER MX600L Helix Performance Premium 5-Speed Hand Mixer mixing up ingredients for a cake is quick and thorough and clean up is a breeze. The overlap design of the 2 Helix beaters on this mixer greatly improves mixing performance compared to the standard design. It is also more efficient because the surface area of the beaters that comes in contact with the batter is double that of most other beaters. These nylon beaters are reinforced for extra strength and durability. In addition to the Helix beaters, you also get a pair of dough hooks, a wire whisk, and a Snap-On storage case. Small batches of bread dough can be made using the dough hooks and if you only want to whisk eggs, whipping cream or butter, then use the wire whisk. All these accessories store easily within the storage case before you snap on the mixer itself. You get absolute control over all your mixing tasks with the 5 continuous speeds plus the Turbo speed, so you’re certain to get your desired results with any kind of mixing task. It has a 250 watt motor and you can start at the lowest speed and slowly step up to the optimal one so as to prevent loose ingredients from flying out of the bowl. If particularly stubborn ingredients need extra power to mix in the beginning, pulse on the Turbo speed button. To clean up, the auto-eject button releases the beaters and they can be cleaned in the dishwasher, while the mixer can be wiped down with a damp cloth. There is a heel ridge design on the end of the mixer so that you can rest it on the rim of the bowl with the beaters, hooks or whisk resting over the bowl instead of outside it. This helps avoid a mess of dripping batter on your counter between mixing jobs. This Organic Coffee Infused Vermont Maple Syrup is the perfect gift for anyone that loves a kick of coffee flavor in their desserts. It is guaranteed to jazz up a routine weekend breakfast of pancakes and the flavor does not come from artificial flavors. Organic Fair Trade Vermont coffee beans are roasted and then brewed in pure organic Vermont maple syrup, so the flavor is pure as well as strong. It comes in a 375 ml bottle that’s nested carefully in a beautiful pine wood crate storage case with dark Mount Mansfield logo and lettering on the front, making it an ideal gifting option. It goes great over waffles, pancakes, french toast and even vanilla ice cream. Opening a corked bottle is not always the easiest task. A dry cork could easily disintegrate with just a few pulls on it or you could lose the cork in the wine and contaminate its flavor. Many corkscrews aren’t easy to use and you have to struggle to open a bottle with care. Not so with the Rabbit R1 Axis Lever Corkscrew. This one is designed to open a corked bottle in 3 easy steps without breaking or losing the cork. This bar tool is very compact for storage, as the arm rests against the body when not in use to make a neat little package. To use it, you pivot the arm out until it’s perpendicular to the body and it locks in place. You raise the lever on the arm and place the body of the corkscrew over the bottle’s cork. Next, push the lever down to press the spiral into the cork and then raise the lever to start pulling out the cork. This should be repeated to pull the cork out fully. Once the cork is out of the bottle, the non-stick spiral is easily released from the cork. To store it away, you pivot the arm back to its vertical position against the body. There is also a foil cutter and an extra spiral that’s stored inside the arm of the corkscrew, so you’re unlikely to ever lose them. The whole thing comes in sleek packaging too. Any barbecue fan would love to be gifted this Martin’s Bar-B-Que Sauce Bucket. It comes from the famous Martin’s restaurant in Tennessee. The set includes 5 small batches of the brand’s famous regional barbecue sauce flavors, so that the recipient can try them all and decide which ones he or she likes best before maybe buying his favorite ones in the future. Or the barbecue fan might be the type to appreciate all the various regional sauces too! The sauces come in a Martin’s galvanized tin that’s useful for storing and carrying all necessary barbecue tools and ingredients from the house to the backyard. Flavors included in this bucket are “Sweet Dixie – a Sweet Molasses and Tomato Base”, “Jack’s Creek – a Sweet and Spicy Vinegar Base”, “Devil’s Nectar – a Really, Really, Really Hot Sauce”, “Alabama White – a Tangy Vinegar and Mayo Base”, and “Palmetto Gold – a Tangy Sweet Mustard Base”. The sauces are all gluten free. Depending on the flavor, these jars range from 12.3oz to 14.5oz in weight. A perfectly done roast turkey or roast anything must be presented perfectly too. That’s where the Canvas Home Abbesses Platter can come in handy. Once the dinner table is set, this platter doesn’t detract from the rest of the table settings but enhances them. It is made from hand-glazed porcelain and has a subtle hand-painted rim in a selection of colors. The body of the platter is in either solid white with a contrasting rim, or a glossy black with a gold rim. The shape of the platter is classic oval and you can buy it in one of two sizes. The smaller one measures 13.5″ x 10″, while the large one measures 16.5″ x 12″. For environmental reasons, plastic straws are out of fashion, so why not encourage a friend or loved one who hasn’t joined the bandwagon to go green by gifting them this gorgeous Set of 4 Izola Reusable Stainless Steel Cocktail Straws? Each straw is beautifully finished with copper plating, so they look great in any glass and in any color of cocktail or other drink. They’ll also stand up to years of regular use, so you know that you’re doing your small bit in reducing paper and plastic waste. The straws are 8.5″ in length, and the set comes with a cleaning brush and a rustic canvas drawstring storage pouch. All chefs and home cooks need a little hot pick me up in their day and they’re sure to appreciate good looking mugs to drink them from. The Yedi Houseware Set of 6 Jumbo 20 oz Porcelain Mugs are made of high quality porcelain in 6 different autumnal colors on the outside with a contrasting color on the inside! The handle size and shape is classic, they’re sturdy without being too heavy to hold, and their jumbo 20 oz capacity will satisfy everyone’s beverage needs. Their good looks mean they can be proudly displayed out in the open and ready to use for all guests instead of hidden inside cabinets. Because each is a different color, guests won’t forget which one is theirs when left about. They come elegantly packaged in a rectangle gift box. These mugs are dishwasher, microwave, oven and freezer safe, so not only are they easy to clean, but they can also be used to bake warm individual portion desserts, or used to freeze desserts that can be served straight away. To help add flair to any holiday gathering, this Set of 4 Glitterville Rainbow Glass Tumblers will make a great hostess gift. They are hand blown glasses that are electroplated with a chromatic sheen and rainbow finish. The lustrous look are sure to bring extra sparkle to a dinner table and can be used to serve water, cocktails or wine. To preserve the finish, these tumblers must be hand washed only, as dishwashing can make them lose their luster over the years. When entertaining at home, it’s always helpful to have at least one easy to prepare dish on the menu so that you can utilize your time sensibly by concentrating on the more difficult items. A platter or board of cold cuts and cheeses to go with drinks is one of the easiest and most popular items you can serve at any party. That’s why a gift of the etuHOME – White Mod Charcuterie Board for your hostess can be a great idea. This board is made of Hungarian reclaimed pine salvaged from 19th century buildings and hand crafted with precision by artisans. To ensure that the wood stays good for years, it has been treated with food safe mineral oil. The slats on the board are meant to maintain their organic beauty but for that modern spin, the rest of the board features a white high gloss hard wax. This board looks so nice that it can be used as a design element in the kitchen when it’s not being used as a charcuterie board. You can get one of two sizes – the 22″ board or the 18″ board. Both are 8″ wide and 0.5″ thick. The handle is 4″ long. They can be washed in soap and water. Not all lovers of home grilling live in houses with backyards or patios and grilling shouldn’t just be a summer activity, so an indoor grill is a great gift for almost any home cook. It can be fired up in the dead of winter and can be used even in small apartments. While we have a previous list of our favorite small indoor grills and the best indoor grills for steaks too, the Philips Smoke-less Indoor BBQ Grill is one of the latest and best models out there. This BBQ grill uses infrared technology with special reflectors to guide the heat evenly over the non-stick cooking grid so that all the food you place on it gets cooked evenly with proper grill marks. Any food with natural fat does not cook in its own grease as it is designed to drain properly. This grill is almost completely smokeless because the drip tray for the fat underneath remains cool due to the same infrared heating. Oil won’t spatter either. It is really easy to use, as you don’t need to adjust the cooking temperature and it takes just a minute to set up. It heats up quickly and then stays at a consistent 446°F, which is the ideal temperature for searing and grilling meat, poultry and fish. It is powerful at 1660 watts. It is easy to clean too. Either wipe down the whole unit once it has cooled or remove the grid for dishwasher cleaning. If you know someone who is environmentally conscious but likes their fizzy drinks, why not gift them a home soda maker? The Aarke – Carbonator II eliminates the need to buy bottled carbonated water and other sodas, as they can be made at home using reusable bottles, thus reducing plastic waste. It also saves a lot of money in the long run, as the only recurring cost other than any flavoring agents comes from the gas cartridges. This carbonating kit includes 1 Carbonator, 1 safe and non-toxic PET bottle, and a user manual. It works with 60L 14.5 oz Co2 carbonator cartridges, which must be bought separately but are easily available and exchanged at most retailers, including online. The Carbonator II is easy to use and requires no electricity or batteries. You first screw in the CO2 cartridge. Then you just need to fill the provided bottle with cold water up to the fill line, screw the bottle into the machine, pull the start lever down and keep it down until you hear a “burp” sound and then release it and you have soda water! Depending on how full the CO2 tank is, it can take as little as 2 seconds. In the first few goes, you can taste the water to see if it’s fizzy enough for you. If not, just do another 1 or 2 pulls until you’re satisfied. While only pure water must be used with this carbonator, you can add flavorings from syrups or even fresh fruit to the water after you’ve finished carbonating it. While there are a few other good carbonate water makers on the market, this machine is probably the most sleek and compact of its kind and it is completely enclosed in stainless steel. You can get them in a few different glossy finishes, like stainless steel, brass or copper. A good knife set is always a good gift for a chef or home cook and the Fleischer & Wolf Portland Ash 8-Piece Knife Set With Wooden Block is great value, as its blades are sharp and each knife is easy to handle. A Portland Ash Block holds an 8″ Bread knife，8″ Chef knife，8″ Slicer，7.5″ Santoku knife，6″ Utility knife，4″ Paring knife, and a 2-Stage Sharpener that has its own indented spot in the base of the block. The two sides of the block are protected by beveled glass and feature a magnetic strip underneath that holds the knives securely in free form so that you can grab one easily. This design is also space saving. Each blade is forged of the highest grade German stainless surgical steel with the edges razor sharp and made to last longer. The handles are also made of the same beautiful Ash wood and are designed to balance just right in your hand to allow for smooth cutting without placing any strain on your wrist. When a blade does start to blunt, use the automatic sharpener that comes in the set. The preset angle of the coarse stage is 13 degrees per side, while the fine stage uses ceramic rods to finish the edge to around 36 degrees. A pitcher like the Montes Doggett Pitcher isn’t just used for water or a cold beverage. It is so beautifully made, that a hostess will love to use it for serving as well as as a display in her kitchen or dining room as a vase. It is hand made in Peru by ceramic artisans and is dishwasher safe. While it is designed to be functional with a hand shaped handle, its unique form makes it look like a piece of art. Fans of barista-style coffee who want a perfect brew at home but without the hassles that come with complicated machines will love the De’Longhi Nespresso EN500 Lattissima One. Making a cup of coffee is quick and easy and cleanup is a breeze too. Anyone can use this single-serve machine with just a press of a button. It is also very compact and affordable. There are just 3 buttons to choose from for operation – Espresso, Lungo or Milk. The Milk button is for making latte or cappuccino. The powerful 19 bar pump delivers wonderful brew that’s perfectly extracted in 40 seconds for latte and other milk beverages and 25 seconds for espresso with a dense and rich crema. The Lattissima One comes with an attached milk tank that you can fill with the desired amount of milk for your single cup of latte or cappuccino, and the machine takes it and froths it directly into your coffee mug. The Nespresso capsules that can be used with this machine come in a variety of Grand Cru blends, with each capsule hermetically sealed in aluminum pods for long lasting freshness. Used capsules get ejected in to a separate tank that can be emptied periodically and the milk tank is easy to remove and wash in the dishwasher. Check out some other good single serve pod coffee makers too. Fans of slow juicing or making nut milks will love the compact and easy to use Hurom H-AI-SBB20 H-AI, Platinum Slow Juicer. Using masticating juicing technology, the juice produced by this machine is pure and unprocessed, the amount of pulp desired can be controlled, and cleanup is easy. There are a few other good slow juicers for you to consider, as the appetite for healthy juicing at home has grown in recent years. Regular centrifugal juicers are fast but they cut and grind the veggie and fruit fibers to a point where the heat produced oxidizes and destroys delicate but vital nutrients. Slow or masticating juicers slowly and gently squeeze them, just like in hand juicing, so that no heat is generated. This keeps the juice at its healthiest and most natural state. The Hurom rotates at a speed of just 60 revolutions per minute, which is ideal for creating the healthiest and most delicious juice. The Hurom platinum slow juicer comes with two hoppers. One is the a Self-Feeding hopper that you just fill with all your fruits and vegetables and it will automatically chop and feed the ingredients into the juicer. If you want to control the order in which the ingredients are juiced or to make nut milks, you use the regular Alpha hopper. Many other slow juicers either make a slight mess while pouring out juice or some juice is left behind in the juicing chamber. The Hurom’s chamber inside is tilted slightly to 3 degrees so that the juice outlet more easily pours out while leaving very little inside. When you’re done, the insides are not too messy, so taking apart the parts won’t create a mess on your countertop. At the same time, the pulp ejector points directly below, so the pulp is collected separately in a container below, thus saving some counterspace with this compact design. If you want to control the amount of pulp in your juice there is a hand lever for that as well as a choice of fine or coarse strainers. This juicer is also quieter than cheaper slow juicers because of its slow rotating speed.